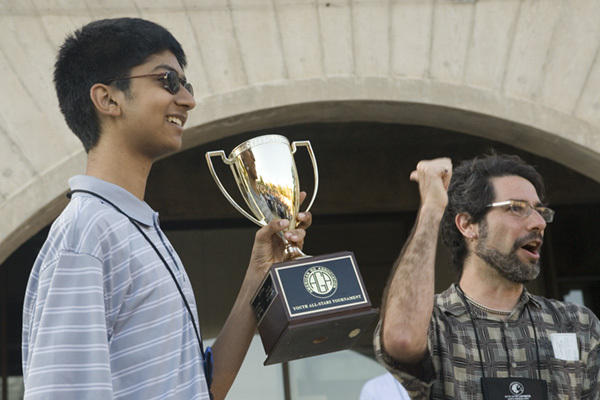 Yongfei Ge 7d (left) won the 2011 U.S. Open, edging out ZhaoNian Chen 7d and ZiYang Hu 7d, who were also 5-1. Ge – who defeated pros ZiYang Hu 1P and Mingming Yin 1P (right) — collected $2,000 for the title while Chen won $1,000 and Hu $500. Yin, who came in fourth in the Open, won the Strong Player Open, winning $500, with Gangshen Shi in second ($400) and Cathy Li third ($300). Other top winners in the U.S. Open were Mengchen Zhang (5th) and Tianyu (Bill) Lin (6th); other top winners in the Strong Player’s Open were Tianyu Lin (fourth) and Hugh Zhang (5th). “Cut?? (Only) if you want to die! Michael Redmond 9P treated the winners of his namesake tournament to a special simultaneous game at the US Go Congress Friday August 5th. 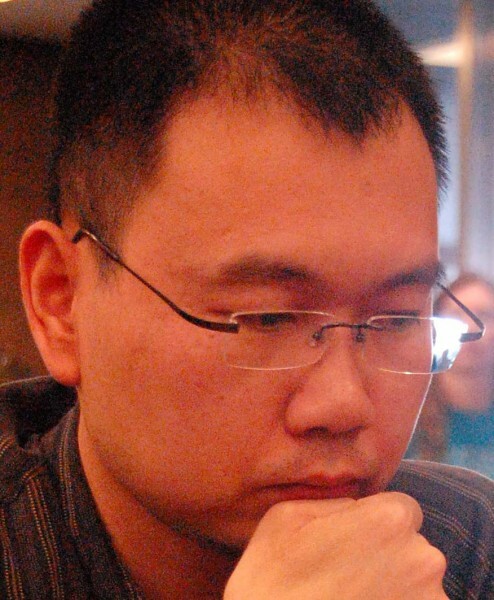 The six players were current Redmond Cup champions Aaron Ye 4d, age 9, Calvin Sun 7d, age 14; last year’s winners: Redmond Meijin Curtis Tang 7d, age 18, and Oliver Wolf 3d, age 12; and current runners-up Gansheng Shi 7d, age 17, and Sammy Zhang 4d, age 11. It was the Junior Division that scored points though, with both Ye and Wolf notching wins against Redmond, at 4 stones, while all of the Senior contestants lost! – Paul Barchilon, E-J Youth Editor. 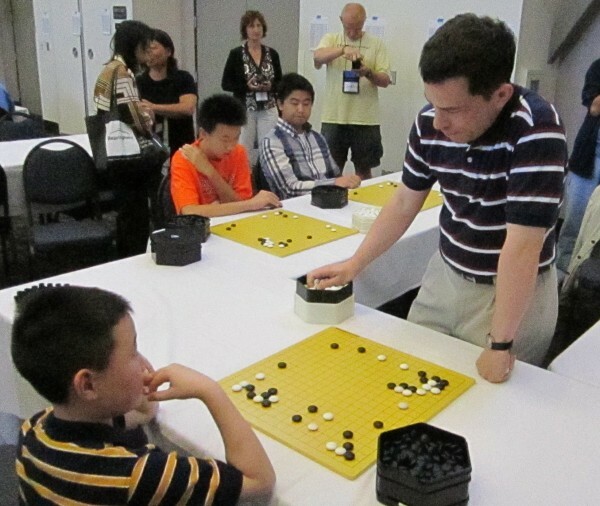 Photo: Nine-year-old Aaron Ye 4d (l) forces Michael Redmond 9P to take heed. 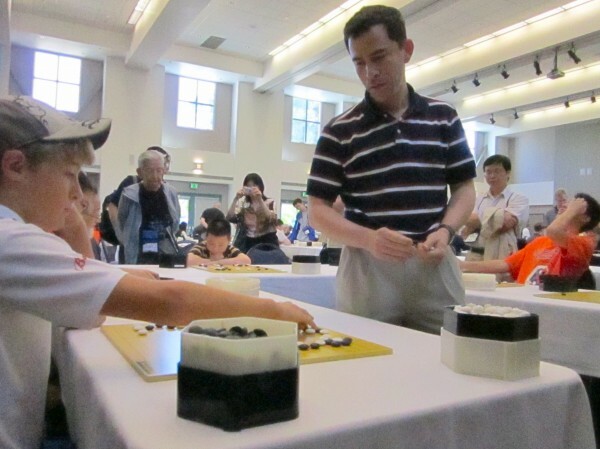 or : Former Redmond Junior Champion Oliver Wolf 4d, age 12, gives Michael Redmond 9P cause to reflect. Dazed and exhausted, I rose from my three-hour slugfest in Round 5 of the US Open Friday with an opponent who had traveled all the way from Japan to torment me with moves I had never seen before. As I left the playing area, I knew what I needed – more go books! 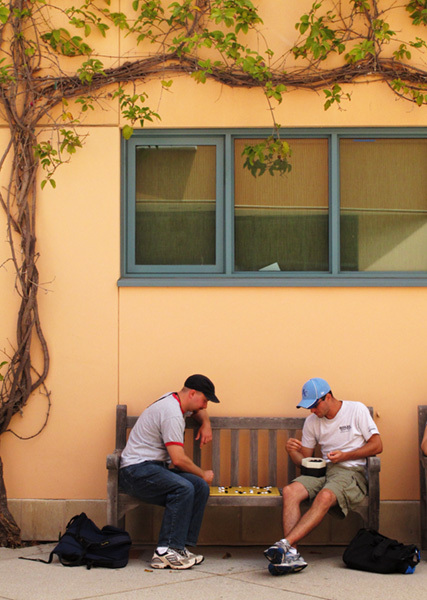 Luckily, the annual Go Congress features a roomful of go books, equipment and more. 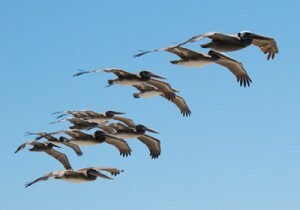 The trick is know where it is. As I left the playing area, I happened to look up, and caught a glimpse of a sign in a second floor window – “vendors here.” Twenty-three steps up and two rights later, voila – the promised land. Near the door, T. Mark Hall (right) was camped out with his perennial GoGod stall. The ultimate compendium of games, articles and miscellany continues to grow; it’s hard to believe it still fits on one disc. 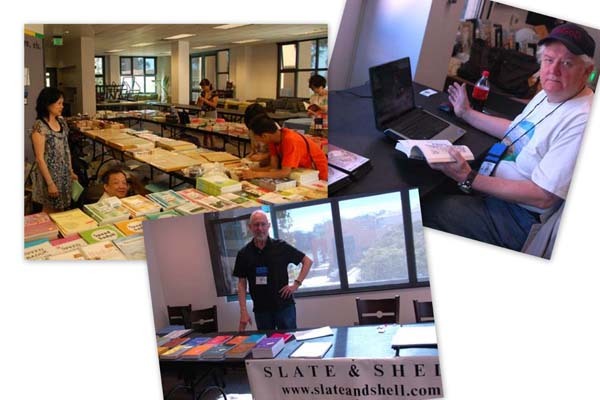 Further inside, I found Bill Cobb (bottom) and Sidney and Katherine Yuan (left), offering tables full of wares from Slate and Shell and Yutopian – which generously donated the board for the NAMT top-board final — respectively. This year’s crop of new titles is fewer in quantity than last year, but very nice indeed in quality, and I left with four more books to begin improving my game for next year’s Congress in North Carolina – two Fairbairns, a super-sized Yuan Zhou survey of top player styles, and the seventh volume in Kiseido’s Mastering the Basics series, Invading and Reducing Moyos. I also skipped a few titles, finally abandoning my effort to maintain a complete collection of all non-beginner titles in English. I’ll tell you why in my next report. 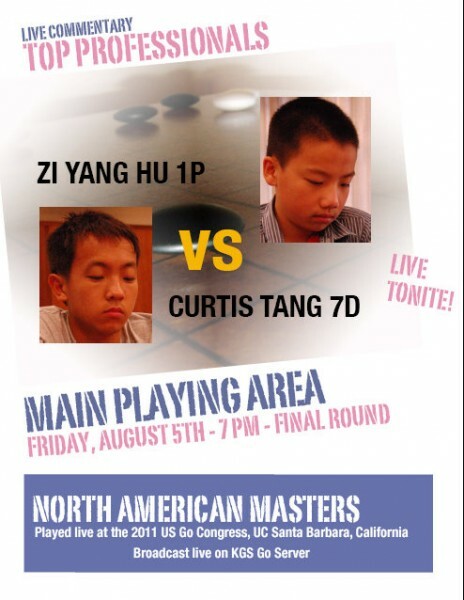 Zi Yang Hu 1P won the North American Master’s Tournament Friday night before a combined crowd of over 500, as hundreds packed into the main playing area at the U.S. Go Congress in Santa Barbara CA and hundreds more watched online on KGS. “Just lucky,” the modest 13-year-old told the crowd after the exciting game – which was commented by a rotating tag team of professionals, including Seo Neong-Wook 9P, Wang Qun 8P, Maeda Ryo 6P and Li Ting 1P — concluded. “He’s way too strong,” finalist Curtis Tang 7d added, as the crowd gave the two young players – among the youngest ever to compete for the title — a standing ovation. 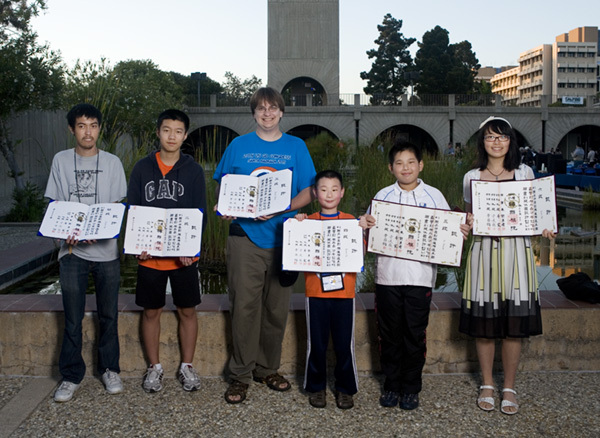 A few minutes later, after a spirited and very competitive auction, Rachel Small and Eileen Hlavka’s $1,000 bid – which goes to fund the American Go Foundation’s educational programs — won them the autographed board the NAMT final was played on, a 2-inch Japanese Hiba board donated by Yutopian Enterprises. In addition to being signed by both Hu and Tang, the board was also signed by the pros who had commented the game. “These are two young players who will go far,” said the AGF’s Andy Okun, “this board is a great investment in the future of go.” Click here to download the commented game (Round 4, Board 1 under North American Masters’ Tournament Pro Game Reviews). CLICK HERE for complete final standings. 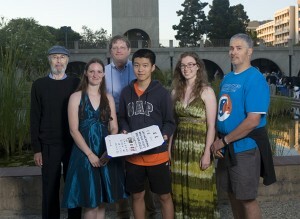 - Chris Garlock; photo by Steve Colburn: l-r: EJ Managing Editor/auctioneer Chris Garlock, Li Ting 1P, Maeda Ryo 6P, Eileen Hlavka, Wang Qun 8P, Rachel Small, Curtis Tang 7d, Zi Yang Hu 1P, Andy Okun (AGF), Neong-Wook 9P & Terry Benson, AGF. Yongfei Ge’s five straight wins make him a near shoo-in for this year’s U.S. Open, which wraps up with the sixth and final round Saturday, August 6 at the U.S. Go Congress. 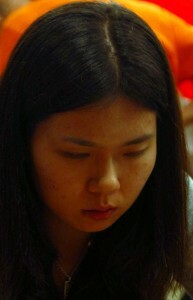 And Mingming “Stephanie” Yin 1P (l) won the Strong Player’s Tournament Friday night with a strong 4-0 record. Here are the 5-0 winners in the U.S. Open: Ge Yongfei; Yuxuan Ye; Aaron Ye; Oliver Wolf; Solomon Smilack; Yunxuan Li; Kevin Fang; Stephen Tung; April Ye; Jordan Betcher; James Carter; Vincent Ma; Michael Lash; James Johnson; Kalinda Fraser. CLICK HERE for complete final standings in the Strong Players Tournament. 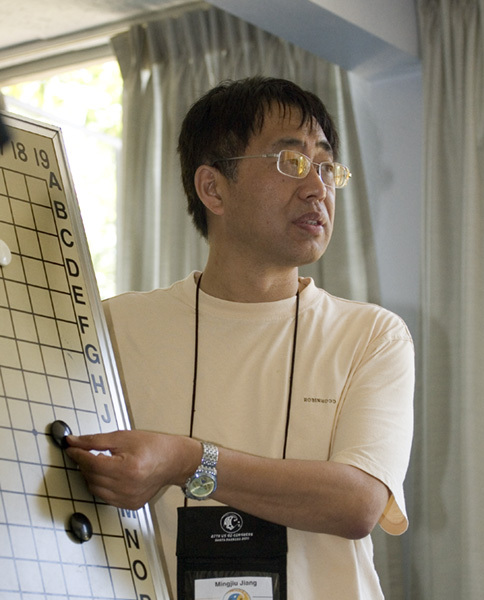 Twenty pro game commentaries — and 55 top-board game records — have now been posted online; including reviews by Michael Redmond 9P, Mingjiu Jiang 7P, Maeda Ryo 6P, Hajin Lee 3P, Jennie Shen 2P and Li Ting 1P. The commentaries are on top boards in the U.S. Open, the North American Masters, and the Redmond Cup.